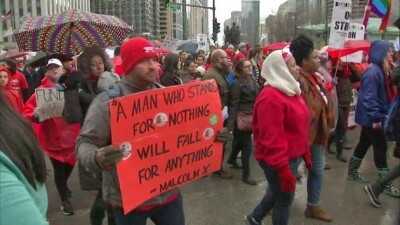 CHICAGO (WLS) — The Chicago Teachers Union took their battle against Chicago Public Schools to the streets Friday with a one-day strike at schools across the city before rallying downtown during the evening rush hour. Following the rally, thousands of teachers and their supporters left the Thompson Center to march through downtown. The group marched north on Clark, east on Wacker, south on Michigan Avenue and east on Monroe towards Grant Park. Teachers and their supporters descended on the Thompson Center to rally after a day of picketing that began early Friday morning. CTU members were joined by a number of labor organizations, students and activists who share the goal of mobilizing people to force Illinois lawmakers to fund public education. Chicago teachers on the move April 1, 2016. Returning to the high school where she taught for several years, Chicago Teachers Union President Karen Lewis began her day visiting a vocal picket line Friday morning at King High School. Lewis hopes shutting down the nation’s third largest school district will wake up Springfield to provide more revenue. With several unions supporting the one-day strike, the action is also an attack on Gov. Bruce Rauner’s anti-union positions. “We have had a dormant labor union for many, many years and it will not get better if the labor movement doesn’t move,” Lewis said. 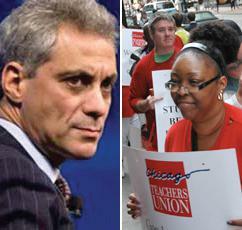 Mayor Rahm Emanuel was also a target in several school pickets, with many blaming him for the lack of funding and failed CTU contract negotiations – even though teachers rejected what Lewis called a “serious offer” back in January. 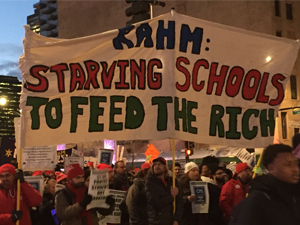 Teachers target Rahm Emanuel during earlier protest where they occupied the Bank of America and withdrew CTU funds from the bank. “I hope they can come to the table and we can work something out and everybody work together instead of fighting against each other,” CPS teacher Marlene McGowan said. Emanuel visited students at one of CPS’ 200 contingency sites, where he criticized the strike but defended last Friday’s furlough. “I don’t think the kids should pay a price for a political message. And there’s a difference between the economic hardships the city’s school district faces versus taking a political action and our kids paying a consequence,” Emanuel said. In response to what he called an “illegal” strike, Chicago Public Schools CEO Forrest Claypool said Friday afternoon he has taken legal action against the teachers union by filing a complaint with the Illinois Educational Labor Relations Board. “We think it’s important that it be clearly established that whether children are in school and being educated is not subject to the whims of the Chicago Teachers Union leadership,” Claypool said. Wendell Phillips High Senior Cameron Miller led dozens of CPS students who support Chicago teachers and are fed up with Mayor Emanuel, Gov. Rauner, and CPS leaders. “It seems like the adults are actually acting like children and we’re the only ones mature enough to try and find a solution to our issues,” Miller said. Teachers protest state attack on public schools. With no state budget and no teachers’ contract, these CPS students said leaders are failing to lead on all levels. “They belittle us. They slash our budget, they close our schools, they tell us we’re not good enough by their actions – and that’s why we’re here,” said Nidalis Burgos, a senior at Lincoln Park High School. They marched downtown from the Thompson Center, to CPS Headquarters, to City Hall, where they delivered a symbolical pink slip to the mayor. “The Board of Ed, the CEO of CPS, they only answer to Rahm Emanuel because they’re appointed by him, so they don’t care about us. They don’t value our voice. That’s how we feel, how teachers feel,” said Charles Kotrba, a senior at Whitney Young High School. 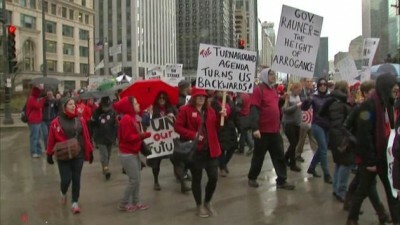 Supporters of the teachers’ one-day strike also gathered on two Chicago college campuses Friday to call attention to the education funding problems. Illinois Governor Bruce Rauner–taking a cue from Michigan Governor Rick Snyder? The teachers then joined hundreds of others for a rally at Chicago State University, which may have to close its doors because of major budget cuts. CSU counts on money from the state, but the state is still without a budget, so their future is unknown. “We have been dealing with this since last July, it’s getting out of control and it’s very stressful on the students,” said Jack Ferguson, a CSU senior. The groups are determined to fight for change: more funding with less cuts to schools and teachers. Service and fast food workers also joined in, saying they want the minimum wage raised to $15 an hour. At virtually every rally, teachers and their supporters named Gov. 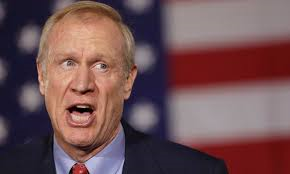 Rauner as the principal villain withholding state education funding from public schools and colleges. “This governor has abdicated his responsibility to the people of Illinois,” said Randi Weingarten, of the American Federation of Teachers. “We have a governor who is trying to take down the state of Illinois and all of its people with him,” said Roberta Lynch of AFSCME. “Governor’s been there for a year now? And the governor is somehow responsible because CPS is on the verge of bankruptcy? I don’t think that makes sense,” said Michael Lucci of the Illinois Policy Institute. The Illinois General Assembly resumes its regular session next week. There’s no word whether the House or Senate will consider any bills related to CPS. More than 340,000 children were out of the classroom Friday as a result of the walkout. The district opened more than 200 contingency sites for students during the one-day strike, including 107 schools, city libraries and park facilities, which offered free activities and lunch to CPS students. Many families in Chicago rely on CPS not only to teach their children, but also to keep them safe during the day. At By the Hand Club for Kids in the city’s Austin neighborhood, an after school program became an alternative for CPS families during the strike. By the Hand Club for Kids was alternate site during one day teachers’ walk-out. “It’s critical that they have somewhere safe to go, and also a lot of parents have to go to work. So they need somewhere where they know their kids are safe,” said Bethany Arvan, By The Hand Club for Kids. Many students at Kennicott Park, one of the CPS contingency sites in North Kenwood, said they support their teachers. Some even planned to rally with the teachers on Friday afternoon. “I think we should all fight for what we believe in. If something isn’t fair, we should all fight for something that is fair,” said Gayun Cannon, an 8th grader. “It’s kind of a lesson for me because the teachers are standing up for themselves and fighting for what they believe in,” said Emily Biggs, an 8th grader. “We have school for a whole year, I think one day won’t hurt that much, right?” said Sydney Thach, a 7th grader. Despite the one-day strike, teachers and students were in class Friday at more than 100 CPS-funded charter schools across the city. Charter school teachers are not a part of the Chicago Teachers Union and therefore, they did not take part in the strike. About 60,000 Chicago students are enrolled at charter schools.